Looking For Local Osborne Park Window Cleaners? Contact CCC Window Cleaning Perth on 1300 72 87 72. For window cleaning in Osborne Park call us at CCC today or fill in the online quote form. We provide professional window cleaning services in Osborne Park for both commercial, industrial, and residential buildings. CCC local window cleaners have been providing regular window cleaning services for Osborne Park industrial and commercial buildings including Barbagallo for the last 7 years. Our Osborne Park window technicians will wash your windows to your specifications guaranteed. Osborne Park was originally predominantly market gardens before World War 2 but later became a residential area. However, by the 1980’s it had become for the most part an industrial area. 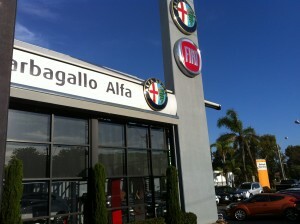 Today it is both an industrial and a commercial area and is home to retail stores like Harvey Norman and has some of the most famous names in auto dealerships including Barbagallo, Ferrari. Hundreds of proud business owners turn to CCC for their regular window cleaning service every year because we provide top notch services in Osborne Park and beyond. Having a regular window cleaning service in Osborne Park will help your business maintain a professional business image for prospective clients and will contribute to an all round atmosphere that’s clean, tidy, and bright. 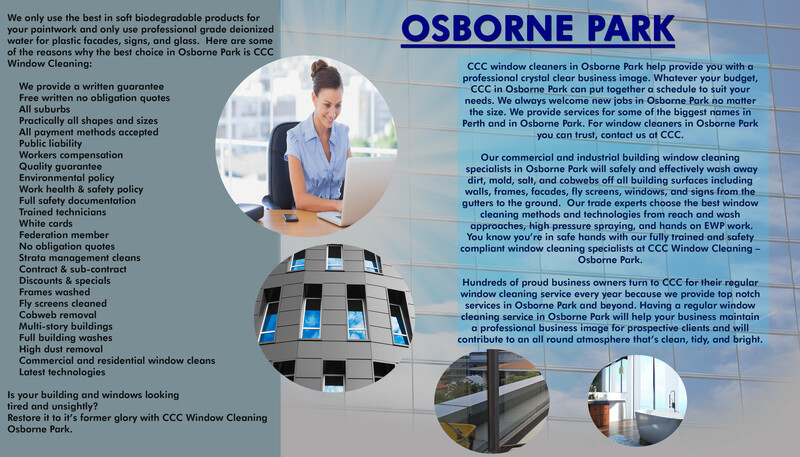 Why choose CCC for your Osborne Park window cleaning services? We provide a written guarantee. Free written no obligation quotes. All suburbs. Practically all shapes and sizes. Online & Over-the-phone payment methods accepted. Public liability. Workers compensation. Quality guarantee. Environmental policy. Work health & safety policy. Full safety documentation. Trained technicians. White cards. Federation member. No obligation quotes. Strata management cleans. Contract & sub-contract. Discounts & specials. Frames washed. Fly screens cleaned. Cobweb removal. Multi-story buildings. Full building washes. High dust removal. Commercial and residential window cleans. Latest technologies. Is your building and windows looking tired and unsightly? Restore it to it’s former glory with CCC Window Cleaning Osborne Park.